Puddle Jumpers Workshop offers rolling admissions year-round, drawing from our waiting list when spots become available. We select children from the waiting list with an eye to maintaining age, gender, and other balances. We favor families who can commit to be with the co-op for at least one year. We strongly encourage you to start the admissions process when your child is between 14 and 20 months old. Children admitted to the waitlist are then eligible to be enrolled at Puddle Jumpers Workshop between the ages of 18 months and 2 years. Once we have received your application and you have visited the school, your application will be considered by the current member families. Puddle Jumpers hosts quarterly Open House events! It's a great way to see the school, talk to parents and teachers, and learn more about us before applying. We post our upcoming open house events on the Contact Us page. If you don't see one scheduled, please send us a message to be notified when the next Open House is scheduled. Please note that Open Houses are for parents only. We encourage you to attend an Open House before applying, but it is not required. We recommend that your child be at least 12 months old when you attend since your application needs to be within three months of the open house to count as one of the two required visits (see Item 3). 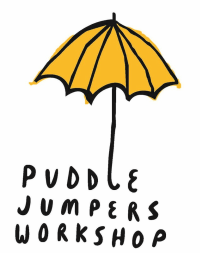 Make sure you have read and agree to the Puddle Jumpers Workshop Membership Responsibilities. Submit the online application, and pay the $45 processing fee when your child is 14 to 20 months old. This fee can be paid via PayPal to pjwtreasurer@gmail.com. Once your application and fee have been received, you will be contacted by the New Member Coordinator to arrange your visit. Applicants must complete two visits. Attendance at an Open House counts as one visit (provided it is within 3 months of your application). Visiting children must be 16 to 22 months old so that they are capable of interacting with other toddlers. These visits are an opportunity to see how your child responds to a group environment, and an opportunity for you to get to know how Puddle Jumpers Workshop operates. You can meet our Teacher, working parents and children, and determine if the school is a good fit for your family. Visiting children are welcome to join in all activities. Visiting parents are encouraged to jump in and help alongside the working parents. Morning visits run from 9:15 to 11:30am and afternoon visits run from 3:00 to 5:00pm. Further details will be provided by the New Member Coordinator prior to your visit. We are looking forward to meeting you and your child! Following your visit, your application will be reviewed by the current member families and you will be notified as to whether you have been admitted. Again, we favor families that can give us a 1 year commitment. If your application is accepted and there is a spot opening up that fits with our requirements, we will offer you the spot immediately. To confirm your spot at Puddle Jumpers Workshop, a deposit and your first month’s tuition are required. The New Member Coordinator will provide more information about payments, paperwork, and orientation requirements for new members. If we are full at the time of your acceptance, you will be notified and placed on our waiting list. Waiting times vary from a few weeks to several months. You will be notified of any openings that match your requirements.